Born in 1881 in the hamlet of Spring Green, Wisconsin, Kate Reely never outgrew the misty river landscape of her childhood. But once she left the farm in the Dells, Reely jumped right into the twentieth century. In some ways, Mary Katharine (her given name) resembled many smart women of her generation. She tried Normal School but decided not to become a teacher. Then she joined the Unity Settlement House in Minneapolis, which served a Scandinavian immigrant community, as a social worker. In 1909 she entered the University of Minnesota where she excelled in English, Rhetoric, and Geology, graduating in 1912. Kate Reely went straight to work at the H.W. Wilson Company of Minneapolis, started by a man who stood on the threshold of library science. Halsey W. Wilson was a pioneer in organizing sources of information: bibliographies, book indexes, and digests. In 1901, he began publishing the Reader’s Guide to Periodical Literature, probably the best known of these sources, which pointed readers toward the articles they sought. But what about people who did not have access to those articles? What if one’s local library, perhaps newly endowed by Andrew Carnegie, did not subscribe to Scribner’s, The Atlantic Monthly, and other magazines that covered current events? Wilson responded to that need. For example, he created debaters’ handbooks. These were notated summaries of articles and speeches that represented both sides of hot topics: woman suffrage, the income tax, capital punishment. Women’s clubs, granges, and service and political groups, along with student debaters, relied heavily on them. In charge of these books were six University of Minnesota alumnae, including Kate Reely, to whom Wilson graciously granted authorship credit. The women conducted intensive research and analysis. Minimum wage and immigration were among Reely’s topics. After a few years, she was promoted to editor of Wilson’s popular Book Review Digest. In 1916, Halsey Wilson decided to move the company to New York City. Kate Reely and two others decided to go with him. That decision took Kate's life in a different direction. It turns out that Kate had made her debut as a dramatist in 1913 with Anyman: A Modern Morality Play in One Act, on the subject of suffrage. In 1914, her play The Helpmeet, a Domestic Comedy appeared in The Masses, a lively Socialist magazine that published articles by John Reed and other radicals of the time. My hunch is that Kate Reely’s friends and colleagues knew something about her writing. But I don’t think they were aware of her participation in Greenwich Village culture and politics at such an exciting time in American history. In 1917, Reely helped start and edit Four Lights, a newsletter of the Woman’s Peace Party of New York City. The biweekly began publication just a few months before the U.S. entered World War I. Four Lights “will attempt to voice the young, uncompromising woman’s peace movement in America, whose aims are daring and immediate – to stop the war in Europe, to federate the nations for organized peace at the close of the war, and, meanwhile, to guard democracy from the subtle dangers of militarism,” reported the New York Times. That same year, The Survey, one of the foremost social sciences journals of the early 20th century, honored Reely’s writings on social and economic issues. Calling itself “a journal of social exploration,” The Survey investigated public health, prison conditions, and other Progressive-era issues. The economist Edith Abbott, reformer Belle Moskowitz, and anthropologist Elsie Clews Parsons were among those honored with Reely. That was pretty good company. Kate continued to wrestle with labor and rural life in three one-act plays – Daily Bread, A Window to the South, and The Lean Years – published in 1919, which were produced widely through the 1920s. She also stayed close to the political left. 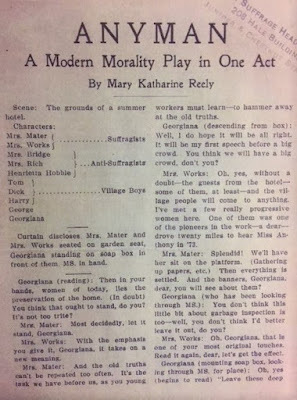 The One Big Union Monthly – published by the Industrial Workers of the World (the “Wobblies”) – featured her play, Solidarity, a Rural Drama of Today, in its August 1920 issue. The play is about a Scandinavian farmer in the Midwest, worrying about credit and paying the bank. August 1920 issue of The One Big Union Monthly. While the H.W. Wilson Company continued to flourish, Kate Reely decided to return to Wisconsin in 1921. She moved to Madison, joined the faculty of the Wisconsin Library School, and edited the Wisconsin Library Bulletin. Then she really got going in theater. It’s difficult to retrieve all of the plays she wrote, but here are a few titles: The House Can’t Build the Barn, a Play in One Act (1923); They Just Won’t Talk! - A Play in One Act (1924); and To Be Dealt with Accordingly: A Play of Social Adjustment in One Act (1924). When Kate Reely died in June 1959, friends and obituaries scarcely referred to her plays and longstanding support of the Women’s International League for Peace and Freedom. Rather, they memorialized her contributions to the state of Wisconsin, especially her service to the Free Library Commission where she had focused on the principles of book selection. Book selection? That sounds like censorship. In fact, it means the opposite. A central tenet of book selection is that librarians must understand the scientific, social, cultural and intellectual forces that shape the modern world. Book selection became Kate’s crusade during the 1920s and ‘30s. The time was ripe. Book-of-the-Month Club, founded in 1926, was well into dictating what middle-class Americans should read. Concurrently, libraries in small towns and big cities alike confronted “vice suppression” – attempts to ban books and magazines deemed immoral or which portrayed the underbelly of capitalism or "radical" views. Even after her retirement in 1947, Kate Reely continued to field questions about so-called weeding in local libraries. It infuriated her. She wanted readers to have all available literature, even if the state paid for it to arrive by mail. After all, she was a writer, too.